We single girls stick together. One of my dearest friends and I have birthdays three days apart, and rather than split the party up over two days, we were excited to celebrate with one big extravaganza. You see, Candace is part of my "urban family," the people with whom I share my successes, my trials, my hopes and dreams, and we wanted to bring our little family together for something spectacular. 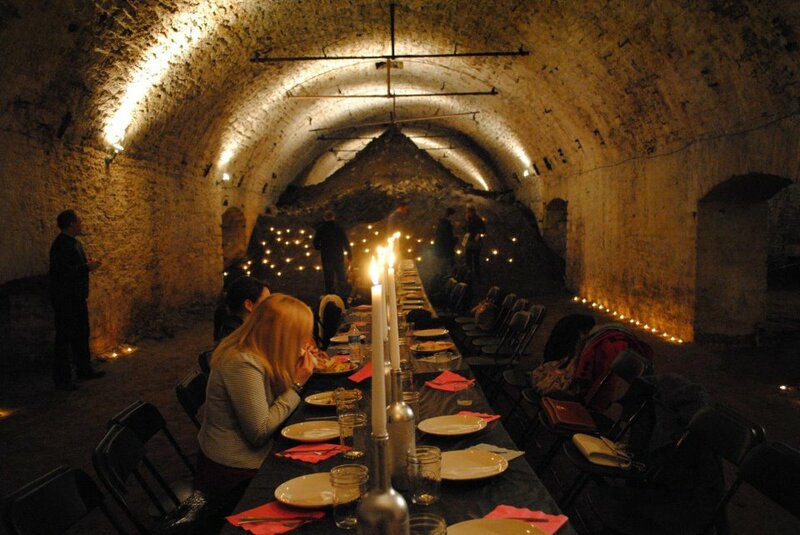 Our merry band of friends and family headed underground for an unusual dinner party in the old Kaufmann Brewery tunnels in Over-the-Rhine. After some careful arm twisting, begging and the calling in of favors, the evening came off without a hitch, and we are forever grateful. We single girls are a force to be reckoned with. Some people have spouses and babies and anniversaries to celebrate and warm beds to claim. Married folks have that one person they can turn to for counsel, commiseration, and compassion. We say, why settle for just one person? Yes. It's absolutely said in jest. We'd love to have a partner in crime. I'd love to find my soul mate. But between the board meetings, volunteer work, collecting passport stamps and other (mis)adventures, it can be hard to find the Nicky Arnstein to my Fanny Brice. So, I turn to the "family" around me. These are the loved ones who help us celebrate birthdays and professional successes. They are loyal to a fault and will fight tooth and nail to defend our honor. Our urban family showers us with phone calls, observes annual traditions, invites us to their dinner table, and will shame any man who wrongs one of their sisters. We are thick as thieves. Women make up most of my urban family - some married, some not. But we also have men in our urban family. Guys who do the heavy lifting, offer genuine compliments, and let us sharpen our talons through political sparring. They are just what a girl would want out of a brother, but without the smelly clothes and spiteful teasing. I love my urban family. I have no idea what the future holds. I wish I could take comfort in knowing all my life's wishes and dreams will come true. Unfortunately, this is no fantasy and I'm pretty certain Prince Charming isn't going to stride up Walnut Street on a white stallion to whisk me away. But who said I needed whisking, anyway? What I need is a life partner. And until I find a man who's worth commingling assets, I'm going to stay right where I am. Life is not easy, and I know hard days are ahead. Some of us will get sick. Some of us will mourn the loss of immediate family members. Some of us will weather financial troubles and relationship drama. Through it all, I know my urban family will be by my side. And sometimes knowing that is all I need. 1. I don't even want to know how you pulled this off. I love the mystery. 2. I mean this with 100% sincerity -- could you be any more awesome?!? Love you!! !